SAN JACINTO, Calif. -- A man from California was reunited with his beloved Labrador retriever who had gone missing on the Fourth of July three years ago. Chela, who is 4 years old, was dropped off at the San Jacinto Valley Animal Campus' night drop area. 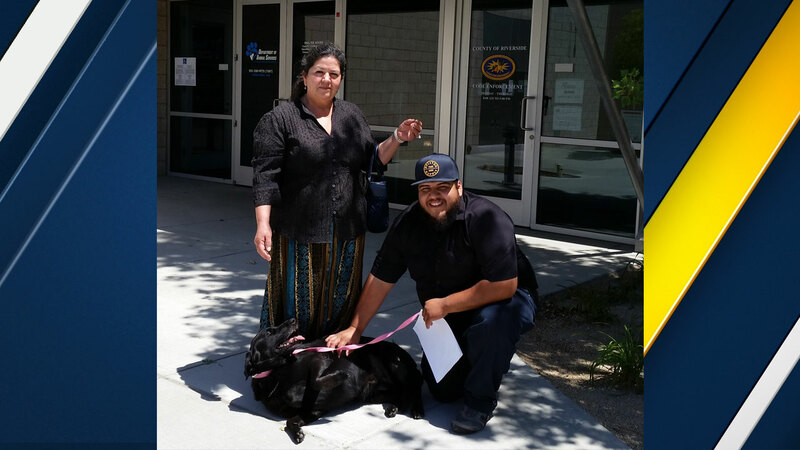 An employee at the shelter then scanned her for a microchip and was able to connect her with her owner, Silvano Reyes. Reyes said he never gave up hope in finding his best friend. After she went missing, he put up fliers all over the area and searched for her on websites. "I drove around like crazy around the area after she went missing," Reyes told shelter staff. "She is a very cute dog and very smart." He credits her smarts as one of the reasons why she survived wherever she was for three years. The Metrolink mechanic received a call with the wonderful news and said he was stunned. He added that he jumped out of bed to tell his relatives what happened. On Wednesday, he headed to the shelter to pick up Chela and the staff captured the heartwarming reunion on video. Reyes said his brother came up with the unique name for his dog. Chela is an abbreviated version of a Spanish phrase that means "beer me," he said. He added that one of the first things he's going to do is put Chela on a diet because it appears she gained some weight while she was gone.